Some Delaware families seeking support and services for the education and care of their young children must navigate the programs and policies of three state agencies – with 11 divisions – as well as private care providers and their local school districts. The First State hopes to make the process easier for families with the help of a $4.2 million federal grant. The one-year Preschool Development Grant Birth through Five (PDG B-5) will help the state better prepare children from all backgrounds to enter kindergarten ready to learn and will improve their transition between early childhood programs and the K-2 system. 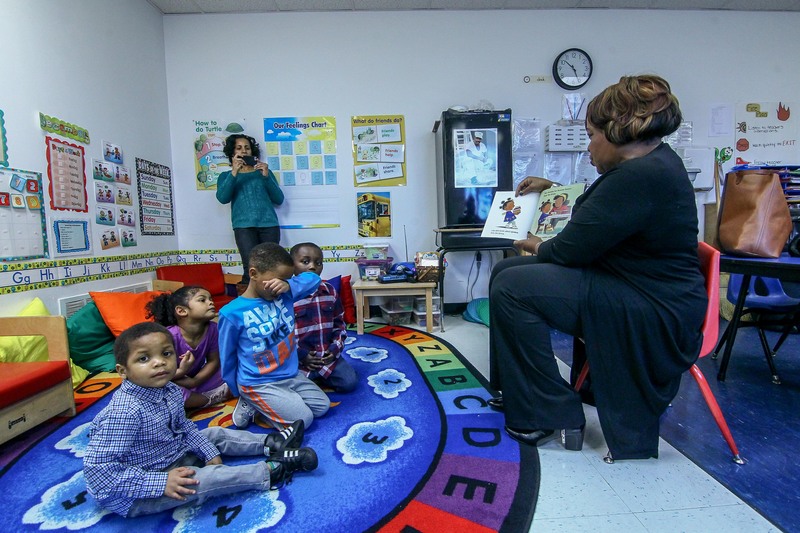 The Delaware Department of Education’s Office of Early Learning – in partnership with the Governor’s Office and other state agencies – applied for the grant to help Delaware study – and improve – how families access early learning services in the state. The goal is to help parents such as Leah Carr. The mother of five, Carr recognized speech delays in her youngest, Faizeer Paddy. Faizeer, 2, is in the Delaware Department of Education’s Early Head Start-Child Care Partnership at Kids R Us in Dover. “As time went by he wasn’t saying more than two words and other kids in his class were saying whole sentences,” Carr said. With a referral from Kids R Us’ director, Carr had Faizeer evaluated by Child Development Watch, part of Delaware’s Birth to Three early intervention system that is under the administration of the Delaware Department of Health and Social Services. He qualified for speech therapy services, which are provided by another entity, Easter Seals of Delaware. If he still needs services when he turns 3, Faizeer will transition to supports provided by his school district. It’s a lot to navigate. “This grant will help us improve the design of our early childhood system to help all children receive the highest quality early learning experiences and be ready for a successful transition to kindergarten,” Governor John Carney said. Critical to the state’s plans is the needs assessment. Delaware’s grant application built upon the state’s early childhood successes and existing priorities, including renewing the Delaware Early Childhood Council’s strategic plan for the next five years, Carney’s executive order making Delaware a trauma-informed state and the Actionable Intelligence for Social Policy grant that the state won to integrate its data systems. “This grant came to fruition thanks to a strong public-private partnership, a testament to Delaware’s shared commitment to quality early learning. The Early Childhood Council’s priorities align with the themes of this grant—improved parent information and access, stronger data systems, and deeper coordination among programs and providers to support children’s development. We look forward to leveraging this opportunity to chart the roadmap for the next five years in Delaware,” said Madeleine Bayard, Delaware Early Childhood Council chair. Carr is thankful for the services her son has qualified for as well as the excellent early education he already is receiving at Kids R Us, a five-star center under Delaware Stars, the state’s quality rating system for early childcare providers. Even after he ages out of Early Head Start, Carr plans to continue his enrollment at Kids R Us. “I love it so much,” she said.